The United Nations human rights arm has voiced deep concern over escalating conflict between the military and armed groups in Myanmar’s Kachin and Shan provinces that has displaced over 100,000 civilians and trapped many in the midst of active fighting. 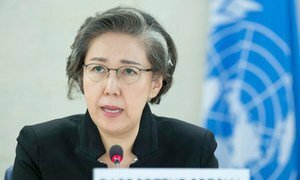 “The protracted conflict in Kachin and northern Shan states has already caused immense suffering, and we urge all sides to work to resolve the situation through a genuine, meaningful dialogue,” Rupert Colville, Spokesperson for the Office of the UN High Commissioner for Human Rights (OHCHR), told reporters in Geneva on Tuesday. On Saturday, at least 14 civilians were reportedly killed and over 20 injured in attacks by armed groups, along with a counter-offensive by government troops in Shan province. There are also reports that Myanmar’s military, known as the Tatmadaw, has used heavy weaponry and aerial bombing in the region. In addition, at least 7,400 people have been displaced in Kachin since early April, adding to the 100,000 already displaced. About 2,000 of these civilians, who were trying to flee the fighting were trapped in dense jungle, before they were reportedly relocated to other towns in the province. “Many more remain trapped in areas of active fighting, with extremely difficult escape routes through mountains and forests, and in need of humanitarian support,” said Mr. Colville. “We urge all sides to exercise restraint and to fully respect human rights and international humanitarian law, ensuring the protection of civilians at all times,” he added. At the news briefing, the OHCHR spokesperson also raised alarm over reports that peaceful demonstrators calling for an end to hostilities, had been arrested in Kachin. “We call on the authorities in Myanmar to respect the right to peaceful assembly and freedom of expression,” said Mr. Colville. The escalation of conflict in Myanmar’s northern Kachin and eastern Shan provinces (bordering China) comes a few months after widespread violence against the minority Muslim Rohingya community in the country’s Rakhine province, drove more than 700,000 civilians across the border of southern Bangladesh where they are living in overcrowded camps, facing the onset of the approaching monsoon season.